Adrien de Mortillet compiled the collection of amulets that we are currently cataloguing, but some of the objects were originally collected or owned by other people. We have two categories on our collections database to account for such people: ‘field collectors’ and ‘other owners’. Finding out more about these individuals helps us to build up a better picture of how de Mortillet acquired these amulets, and how he might have been connected to other collectors / owners. One example is this Zuni Native American amulet carved from stone. It resembles an animal and could possibly be a hunting or war amulet. It was acquired by Colonel James Stevenson (1840–1888), who starting collecting objects from the South West Pueblo Zuni people after he led an expedition to New Mexico in 1879, sponsored by the Smithsonian Institute. 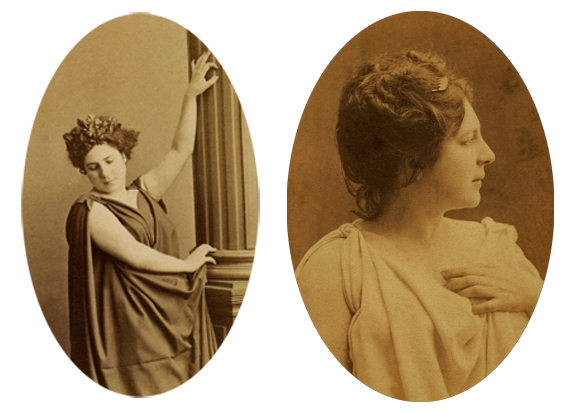 He was accompanied by his wife Matilda Coxe Stevenson, who became a respected anthropologist in her own right. De Mortillet acquired this object in 1888, the year that Stevenson died. It is possible that de Mortillet benefited from the disposal of some of Stevenson’s collections preceding or – through his wife’s actions – following his death. It is one of five Zuni amulets that de Mortillet collected but the only one to make it as far as the PRM (a large chunk of his collection is in Paris). 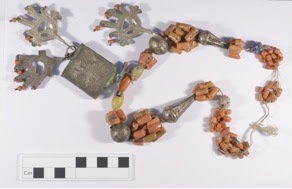 Another example is this necklace with a silver relic box and hands of Fatima (hamsas) attached to it, which was once owned by the French actress Marie Leonide Charvin (1832-1891). Charvin was a successful theatre actress under the stage name of 'Madame Agar'. However, she was blacklisted in Paris after performing in a benefit concert organized by the revolutionary and anarchic Paris Commune in 1871. Hamsa amulets like this were common across North Africa and indeed, Mme Agar died in Algeria where her second husband Georges Marye was the curator of the Museum of Antiquities in Algiers. 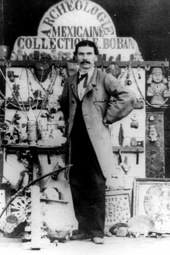 Some of the other owners or field collectors mentioned include Eugène Boban (1834–1908), a French antiquarian and dealer who collected Mexican objects, and Paul Maurice Pallary (1869–1942), a French-Algerian zoologist who collected objects from Algeria. Finding out the stories surrounding the people linked to these objects adds more to the seemingly never-ending layers of interest in this collection!